This mod is really simple in concept and design. 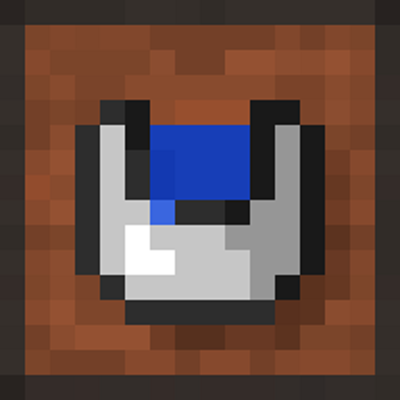 It allows you to take your helmet and use it to pick up basic fluid blocks in the same way as a bucket. The goal of the mod is to provide early game solutions to simple problems. With the main problem being accessing iron to create gardens or fuel machines. This mod is so nea— uhh, I mean, cool? xD I fell for it! Would you mind updating this to 1.12.2 ? Please ! I stumbled upon it by chance, never noticed it was one of your mods. Its on the todo list to be updated as VE-FluidHandler addon just like wooden buckets. This way we can add an endless number of supported helm types. Prince Igor likes this mod. Lol, a bit funny and interesting mod. I'm impressed with a number of your SBM series mods they are practical and creative. This and wooden bucket mods are just plain logical and add something that seems to have been simply overlooked. Will the code allow for configuration to control the type of fluids go into both of your bucket mods? IMO it breaks the logic by putting lava into a "wooden" bucket. To be fair I disagree with lava going into a metal bucket too, but the key to enjoying movies and games is a 'suspension of disbelief'. It's my experience as a role player, D&D and the like, that helped me understand that pushing that suspension will break a player out of immersion, and turn these little gems into just a cheap easy work around to the environment. I guess in the end what I'm asking is not that you remove the ability because that caters to wishes of many players who simply want to accomplish tasks, but, if you could make this configurable so I can add the realism it provides to a ModPack I'm working it would be greatly appreciated. I'm not experienced in programming, not intimately anyways but, is it possible that instead of using the ID of the helmet, check if an item will fit into that slot? Wouldn't that make it more quickly adaptable to all helms? I do understand that it wouldn't have the graphical support of having it's own icon after use, but I think it should improve compatibility with other mods.. There are some things that go into armor slots that are actually not armor. Plus we have to make reversed textures that have a cut out in the back of the helm to make the rendering work. Aside from that, there will be configs in the future to enable/disable features of the mod. This will include fluids and advanced logic for the mods. For example, wooden buckets has options to make carrying hot fluids damaging. This includes setting the player on fire, damaging the item, and causing the bucket to leak the fluid. In which each drop that is leaked can set the area on fire. Most likely the helm buckets and other buckets will support these same options. That is awesome. And thank you for your reply. I actually went through the trouble of recovering my password just to post, my first post on this site actually lol. Keep up the great work.